"Giraffe spot patterns are complex and can be quite different among individuals, but we don't really know their purpose in the wild," said Derek E. Lee, associate research professor at Penn State and first author of the paper. "Complex markings can help animals evade predators, regulate their temperature, or recognize family or individuals, all of which can affect their ability to survive and reproduce. In this study, we analyzed survival records and photos of spots of Masai giraffes, and show that spot patterns do affect juvenile survival and are heritable — they are passed from mom to baby." Giraffe skin color is uniformly dark gray, but their spots are highly variable in color and shape, ranging from nearly round with very smooth edges to elliptical with jagged or lobed edges. Spot patterns do not change as an animal ages, which allows researchers to identify individuals based on their unique patterns. This study revealed that newborn giraffes with larger spots and irregularly shaped spots also had increased survival during the first few months of life. 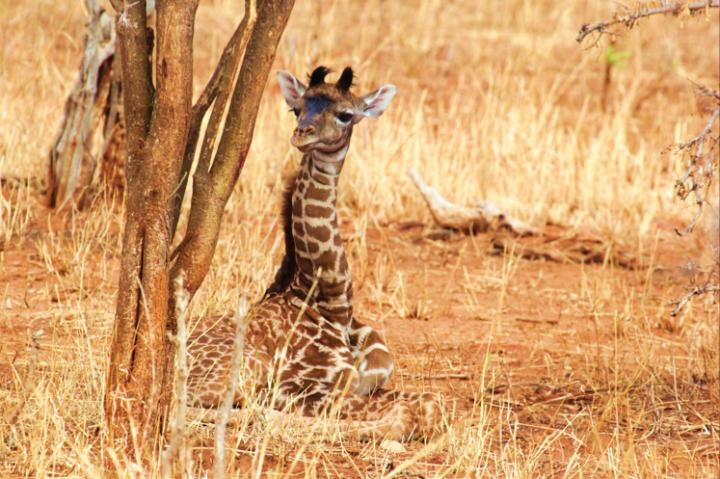 This increased survival could reflect better camouflage of these young giraffes, but it also could be related to other survival-enhancing factors, such as temperature regulation or visual communication. The study also found that two of eleven spot traits measured, circularity — how close the spot is to a perfect circle — and solidity — how smooth and complete the edges are — were significantly similar in mothers and calves. This suggests that these traits are inherited by the calf. "Dr. Anne Innis Dagg, the first giraffe field researcher in Africa, presented evidence in 1968 that the shape, number, area, and color of spots in giraffe coat patterns may be heritable, but her analysis came from a small zoo population," said Monica Bond, graduate student in evolutionary biology and environmental studies at the University of Zürich and an author of the paper. "We used wild giraffes and modern imaging and analysis techniques to confirm her conclusions." This study also highlights how modern image software and statistical methods can be used to reliably analyze complex coat patterns. "My hope is that other scientists will use the same tools to measure mammal coat patterns to advance our understanding of what these patterns mean," said Lee. "Quantifying heritability and fitness consequences of variation in coat patterns could help us understand how and why complex coat patterns evolve in wild animals." In addition to Lee and Bond, the research team also includes Douglas Cavener, Professor of Biology and Verne M. Willaman Dean of the Penn State Eberly College of Science. Financial support for this work was provided by Sacramento Zoological Society, Columbus Zoo and Aquarium, Tulsa Zoo, Tierpark Berlin, The Living Desert Zoo and Gardens, Cincinnati Zoo and Botanical Gardens, and Save the Giraffes.